Middlesex University students are vying to compete in the Enterprise Development Hub's annual Online Sales Competition. Running alongside the workshop series 'Selling on Ebay and Amazon', budding entrepreneurs have a chance to receive full support from internet expert Steve Stott (pictured far left) to set up an online shop on either of these two platforms and receive advice on how to sell, compete, advertise and win customers, as well as register as self-employed. A shortlist of six finalists will battle it out for a total prize pool of £5,000, which will enable them to fund their online stores and see the competition winner walk away with a £1,000 first prize. Following a 'Getting started' session, the six competitors will receive individual mentoring and access to group workshops as they aim to post the best figures over 12 weeks of live selling. 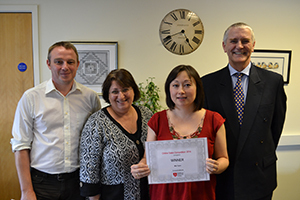 The inaugural 2014 edition of the competition was won by Mental Health Nursing student Mari Tyson (pictured second from right) with her venture, Sakura Health UK selling a range of Japanese-influenced therapy products. "When I found out about the competition, I realised it would be the perfect opportunity to get my business started as I could take advantage of the support and mentoring offered at the same time," commented Mari. "It also gave me a great chance to 'road test' some business strategies; to find out exactly which products customers prefer; and to troubleshoot potential problems at an early stage." d. Financial analysis and planning. The finished plan should be emailed to edh@mdx.ac.uk by the 14 February 2015 at 12pm.